Nwarebea Baffoe (left) and Rebecca Henry, both age 6, stop by after school to visit with the Rev. Janet Corlett at Bermondsey Central Hall Methodist Church in London. Editor’s note: This is the first of an occasional series of stories, “British Methodism: Staying relevant in Wesley’s homeland,” about today’s Methodist Church in Britain. In the shadow of the Shard — a 21st century building that is part of the modern London skyline — sits a British Methodist church that has been ministering in the Borough of Southwark for more than 125 years. Bermondsey Central Hall no longer has its grand 2,000-seat sanctuary. But behind a Victorian façade, the congregation’s South London Mission continues to assist the neighborhood’s diverse population as the big-city divide between rich and poor widens. Bermondsey Central Hall Methodist Church serves a diverse congregation of about 250 and houses the South London Mission, which has been supporting the community since 1889. The modern London Shard skyscraper rises behind the church. Peter Baffoe, 35, who grew up in the neighborhood and whose family has been part of the Bermondsey congregation, is a witness to the more recent changes. “We’ve got extreme wealth — just to the left of us on Bermondsey Street, you’ll see flats going for millions of pounds. And then, just a stone’s throw away, you have the Meakin estates, which is social housing for people with very low incomes,” explained Baffoe, who works for the South London Mission. The Rev. Katy Thomas (rear) presides over a "Tiddly Nativity" activity for young children at St. Mary's Methodist Church in Handforth, England. The church is one of three Thomas serves in the Greater Manchester area. Bermondsey is not a Methodist tourist mecca like Wesley’s Chapel, built by Methodism’s founder John Wesley as his London base, or Methodist Central Hall Westminster, across from Westminster Abbey. But their congregations are all growing, filled with Methodists who have come to London from many other countries, mostly from Africa. And all three are trying to respond to the communities around them, to be relevant — both spiritually and socially — in today’s London. Methodist Central Hall, Westminster in London hosts a traditional carol service during Advent. The hall was built to mark the centenary of John Wesley's death and hosted the first meeting of the United Nations General Assembly in 1946. Such growth is not the norm for many other congregations in the Methodist Church in Britain. A report released during the 2017 British Methodist Conference last June showed that membership had dropped significantly below 200,000 — to 188,000. The Rev. Martyn Atkins of Methodist Central Hall Westminster will speak about the Fresh Expressions movement during a Florida Conference event Feb. 22-23 at First United Methodist Church in Lakeland. The silver lining to this cloud: churches reach an estimated half a million people weekly through cafés, youth clubs and alternative forms of church. In addition, despite being “quite top heavy” with older-generation members, youth involvement in the church is increasing, says Michael Pryke, the current youth president. Attendance at 3Generate, an annual event for children and young people aged 8 to 23 years, has jumped from 200 to 1,000 in the past five years. Loraine Mellor is president of the British Methodist Conference for 2017-18. 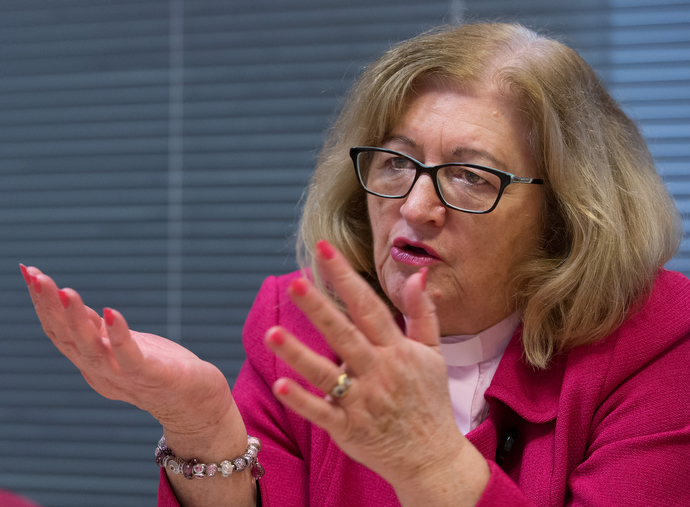 In the months since her address, Mellor has been encouraging churches to ask the “life or death” question “much, much earlier,” she told United Methodist News Service. If a church only has a year left of funds to keep itself afloat, “that’s too late to ask the question.” The answer could be either, “‘Yes, let’s have a plan for growth’ or ‘We know that we’re dying, so let’s go for that in a positive way,’” Mellor said. One church that chose to live, nearly a decade ago, was Cleggs Lane Methodist Church in the Greater Manchester area. The transformation started with a weekly men’s health group and led to a local ecumenical partnership —Wharton and Cleggs Lane Church and Community Centre — with programs that include a café, gardening group, crafts group and woodworking workshop. Wesley’s Chapel in London was built in 1778 by John Wesley, the founder of Methodism. The church today serves a membership of hundreds of people drawn from every continent of the globe. A statue of John Wesley, the founder of Methodism, looks out over the courtyard at Wesley's Chapel in London. The chapel, which considers itself the "Mother Church of World Methodism," hosts a thriving congregation with members from every continent. Even with the decline in membership, there are too few clergy to go around. Wilmslow Methodist Church in northern England previously had a minister solely for that congregation, but when the Rev. Katy Thomas arrived, she also had to take the helm of two smaller and very different churches, St. Mary’s and Styal. The Rev. Keith Sandow sets out Papier-mâché figures for the Lantern Parade hosted by the Kettleshulme Methodist Church in Northern England. The Methodist chapel in the village of Styal in northern England was converted from a grain store in the 1830s. View more photos from United Methodist News Service's trip to England on our Flickr page. What does it really take to grow the British Methodist Church? The Rev. Martyn Atkins, former Secretary of the Conference and current superintendent minister at Westminster, said the church’s experiment over the past 14 years with what it is called “Fresh Expressions,” has demonstrated that making new disciples is just plain hard work. Successful ministries take longer and cost more than expected “and whatever you think you’re going to do, you’ve got to do it twice as zealously or twice as creatively to get what you thought was the answer you were going to get,” added Atkins, who is chairperson of the Fresh Expressions board. She has created “Mummies Republic” at the South London Mission, teaming up with government and social agencies to address the mental health issues and physical and social needs of vulnerable mothers with children aged 5 and under. “My thing has always been to create a fresh expression of church so that I feel Jesus is walking in the neighborhood,” she declared. Methodist Central Hall, Westminster in London was built to mark the centenary of John Wesley's death and hosted the first meeting of the United Nations General Assembly in 1946. For the Rev. Jennifer Smith, who became the superintendent minister of Wesley’s Chapel last September, the concept of taking Jesus outside the church building is crucial. Christmas lights decorate the busy Oxford Street shopping area in the West End of London. Read the second story in our series, British church stays alive through service.